Universal 16-Bit Multi-I/O DAQ (14 AI, 2 AO, 20 dig.IO) with galvanic isolated USB host-interface. 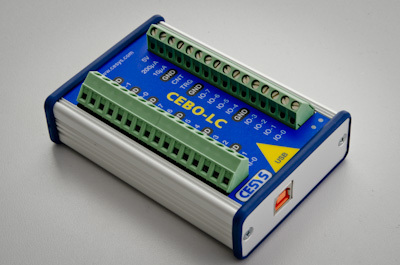 CEBO-LC® is a high-precision 16-bit multi-I/O USB measurement laboratory with built-in isolation. It comes with drivers, API, example source code and ready-to-usw datalogger & measurement software for Windows, Linux and OS X. You can use it with apple® computers, PCs running Windows® or Linux® - and even with a Raspberry Pi. Response-time (Latency): 0,9 ms typ. / 4 ms max. all digital I/O signals are short-circuit-proof. 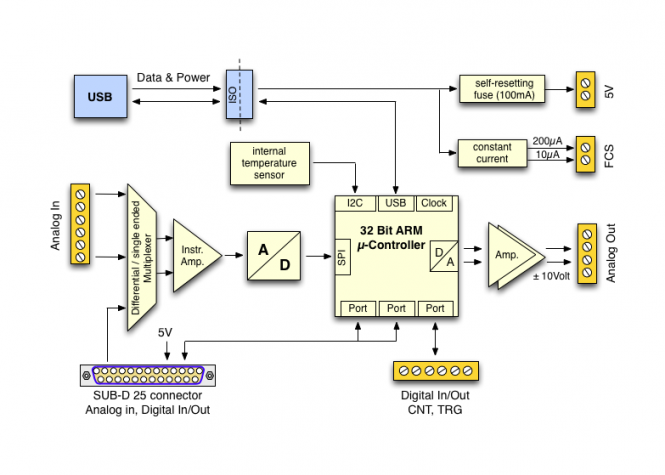 Internal digital temperature sensor for cold-junction compensation (CJC) when using external temperature sensors. 32-Bit Counter with extra "CNT" input. external trigger "TRG" can be configured as Input or Output. Synchronisation of multiple devices using the TRG signal (Master/Slave). 2 fixed current outputs to measure resistors or resistive sensors. fixed currents: 10 µA and 200 µA. DAQ timing: software controlled, hardware-controlled by internal precision oscillator, by external trigger signals. DAQ modes: Single value acquisition, acquisition of fixed-length data blocks, (triggered by software or external trigger), continous DAQ (streaming). Host connection and power supply via USB 2.0 (full speed, 12MBit/s). No carryover of noise from the computers in your test setup and no annoying "ground loops" due to the electrically isolated USB interface. The GND of CEBO LC is not connected to the ground of the host! High-performance and easy-to-use programming interface (API). 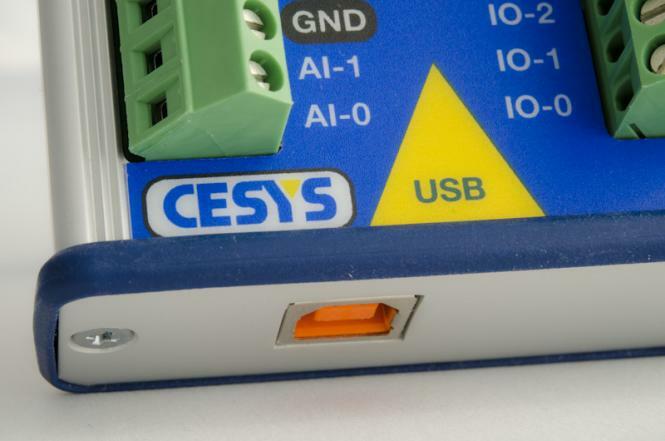 The USB connection to the host is electrically isolated. A mutual influence of the computer and the test setup is prevented effectively. 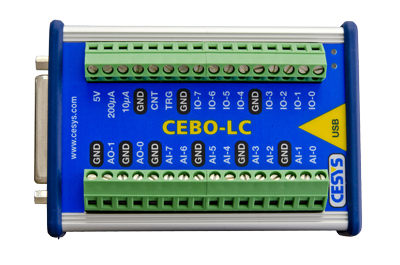 The outputs of CEBO-LC® are short-circuit proof. The inputs are protected against over voltage. Power is supplied via the USB 2.0 interface. The integrated temperature sensor allows the determination of the reference temperature for cold junction compensation (CJC) when connecting thermocouples. The electronics of CEBO-LC are encapsulated in a rugged aluminum housing and has no-slip rubber fittings. The integrated USB socket has a high insertion force to prevent unintentional disconnection of the device. Large 5mm screw terminals enable easy connection of sensors, actuators and measuring signals. The software CEBOLAB comes free with the device (downloadable). With CEBOLAB, measurement tasks can be easily done. Also, there are programming interfaces (API) for all major languages and LabView® examples. 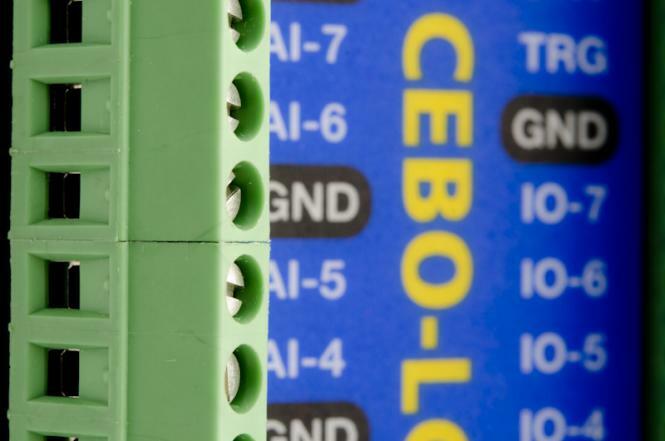 The CEBO-LC® is also available without screw terminals and without housing (OEM version).